It was the perfect day. The weather was incredible. We’d looked beyond the ski area boundary signs before, of course, but this — the crystal clear visibility — meant we could see for hundreds of miles. From this high up — the very pinnacle of Mount Hutt, in the New Zealand Alps — we could actually see the curvature of the earth. And it looked like the snow-wrapped mountains extended the whole way there. Every time I look at this picture I well up, not because it’s good but because the memory — of unspoilt nature at its most breathtaking — is so special. I was living what The Displaced Nation likes to call la dolce vita. Today and for the remainder of the month, I’ll be urging you to live la dolce vita as well, by conjuring up the sensory aspects of travel. 1) It has to be isolated. Maybe that’s just me, but I love the wilderness, that connection to nature, that feeling that this view may not have changed for a thousand years or more. 2) It has it be high-up. I love to be high (no double entendre intended!). A bit of altitude can reveal the magnificence of even a tortured landscape. How peaceful does the Earth look from space, eh? 3) It has to be dramatic. What separates one pretty landscape from another? In my humble opinion, there needs to be some drama, something visually astounding: the scale of the place; the way color dominates it; the patterns of light and dark; the capture of elemental forces at work… Drama is in most places if you look for it. I very rarely take pictures — which doesn’t exactly lend itself well to a life of writing and blogging. I’d been in Thailand for six months and taken only one photo when my parents (in despair!) sent me a camera for Christmas. It was great! I gave it to a friend. Luckily, I am now married to one of the afore-mentioned beautiful women — and the pictures I don’t take, she makes up for in spades. Seriously. She has been known to take over a hundred pictures just to ensure having one good one (but she keeps them all). She takes photos of flowers! Of swans! Of cows! And of yours truly! Thank goodness — otherwise, I wouldn’t have been able to share with you the above alpine view, except with words. Please tell all in the comments! In addition, I urge you to send me a photo of that view: tony@thedisplacednation.com. With the help of my better half, I may be staging a “la dolce vita slideshow” before long! STAY TUNED…for Monday when The Displaced Nation’s agony aunt, Mary-Sue Wallace, will be addressing cross-cultural quandaries and travel-related confusion. 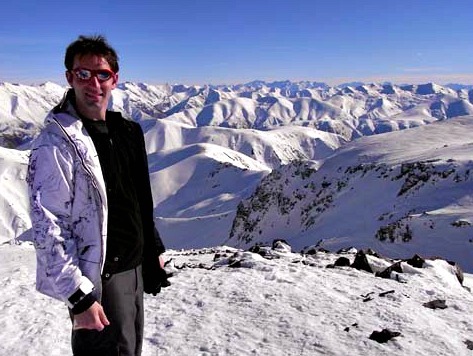 Img: Tony James Slater in the New Zealand Alps, taken at the top of Mount Hutt (December 2009). The view from the top of Cairngorm Mountain near Aviemore in Scotland does it for me every time. Not quite not as high as your picture, and can be busy at times as its one of the busiest skiing areas in Scotland, but the view is amazing. Picture sent to Tony! In the Dongrek Mountains between Thailand and Cambodia lies the Khmer temple of Preah Vihear, on the edge of a cliff with a view that stretches for miles below. You can’t get there now thanks to an absurd dispute between the two countries border this amazing place but for those who have, the experience is unforgettable. Wow Janet, that is an incredible pic. You’ve taken the ‘isolation’ part seriously then! I wish I could go there and see that temple for myself, it looks incredible – but of course, politics always intervenes eh. Pah! War. Who needs it? Poas Volcano in Costa Rica, 8885 ft (2708 m) high. It’s often shrouded in clouds or mist, but we were lucky enough to catch an unobstructed view of the volcano in all its steamy splendor. I sent you a photo. Thanks for the photo Miss Footloose! It’s amazing – reminded me of one I took in New Zealand in the hot springs, of miniature mud volcanoes bubbling away. Of course there’s nothing miniature about the volcano in your pic! It looks extremely a) high, b) remote… and I think we need a new category – FEARSOME!!! Oh, this post has reminded me of so many beautiful moments and breathtaking views! The Negev desert in Israel, especially in springtime – I haven’t seen such colors anywhere else in the world. The Great Ocean Road in Australia. The view of the ocean from the courtyard of the Grand Mosque in Casablanca, Morocco. Lake Como from the highest point of Bellagio in Italy. Thank you for bringing back the memories in such an inspiring way! Just to play the contrarian for a moment, as is my wont. While I appreciate your having enjoyed “the perfect day,” as the post begins — how often does that happen on one’s travels? I mean, some of us don’t have that sort of luck. We hike all the way up to the top of Mt Fuji (no easy feat btw) to see the sunrise, only to find it’s too windy and rainy to see anything at all. Is it still possible to enjoy la dolce vita under such circumstances? Oh hey, it’s not all about the weather! I saw the most amazing beauty – nature in fury – in a tropical rainstorm in Malaysia just before Christmas. And I got soaked :0) It’s back to beauty being in the eye of the beholder – when I’m in a particularly good mood, I see it everywhere – frosted spiderwebs, pretty children playing outside my house, a sleek sports car sitting next to me at the traffic lights. Equally, when I’m pissed, I see my mood reflected in my environment – bloody cobwebs, incessant and annoying kids shrieking right outside my front door and God-damn traffic lights!! My most heart-stopping view was actually a collection of views of the Pacific Ocean from the Pacific Coast Highway. Just when I thought I’d seen the most amazing scenery ever, we’d round a corner & something better would appear. The most plain & simple view which stopped my heart is the first time I saw a palm tree. I grew up in Michigan & always dreamed of traveling the world, but had never gotten out of my tri-state area. Seeing that tree, at the very not beautiful Los Angeles airport, was a symbol that I had finally taken my first step towards achieving my dream.